Our ActivShaper™ DLX slimming bootcut pants are the superheroes of slim! With a full power-mesh liner from waist to knee, they provide shape, hold and control. Built for your workout, but so attractive, comfortable and slimming, you’ll find yourself wearing these bootcut pants almost anywhere. Wider waistband provides extra comfort and support. 55% polyester/35% cotton/10% spandex. Machine wash. USA. Black. AWC Sizes 1–5. Size 2 has 32" inseam. I have tried on lots of workout pants. These are the only fitted ones that work for me. They are worth the money. Have 5+ pairs of these pants! Love these pants so much that I have more than 5 pair!!! I WEAR THESE AROUND THE HOUSE OR RUNNING ERRANDS OR TO THE GYM OR ANY CASUAL THING. VERY COMFORTABLE PANT, LOOKS NICE, HOLDS THE SHAPE, ALLOWS EASY MOVEMENT AND BREATHING. I love these - they really fit better than any I have tried on at a store - but for me - ordering a size up fits best. This is the only product I have ordered that I have liked and I have bought quite a few.I have a pair that is three years old and are still in great shape. That is why I bought another pair. I'm a very active 50-year-old woman. I currently teach Pilates and need proper attire for group fitness. Over the years I've gone through lots and lots of trendy workout clothing that never lasted very long. These pants are high quality and fit my apple shaped body perfectly (I'm 5'6"). They wash and wear very well too. I especially like the elastic one inch waistline. They are so comfortable I could wear them all day. I have these and the active shapers. These I can wear on the street as well as working out. I have the capris, as well. I wanted another pair of these, but they still only have black. I WANT COLORS TO CHOOSE FROM! These pants fit great and are very supportive and slenderizing through the upper thigh and tummy. I wear these pants for step aerobics, kick boxing, jogging, and just for casual wear. I bought two pair of pants to compare: the Activeshaper DLX and the Activeshaper Bootleg. 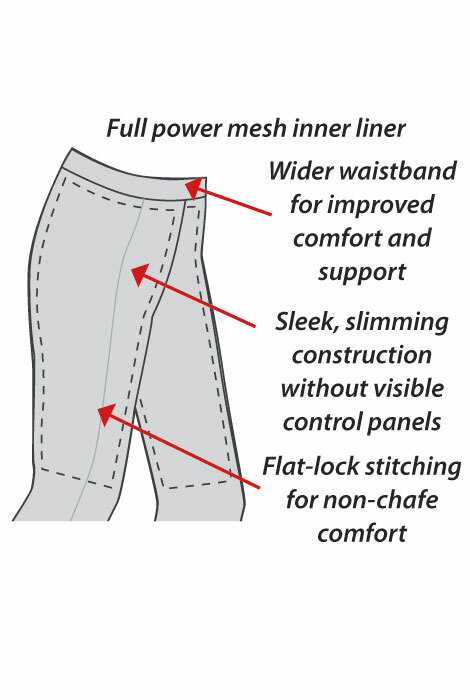 I don't like how the DLX fit at all- too tight around the hips, too loose around the leg, way too long for me.i'm exchanging them for a 2nd pair of Active Shaper Bootleg Pant which are terrific! Have not worn yet - too long!!! Wear the shorter version - capri - constantly. In fact, I have worn them out. These --- I need to find someone to shorten so I have not worn them yet. Bummer!! These are NOT the DLX bootcuts AsWeChange used to sell. Must be a different material and they don't retain their shape. I was pulling up droopy pants all day. I'm an aerobics instructor and these pants are perfect for that activity. I have purchased several of these ActivShaper Pants, they fit me very well, and they are great to workout or just go walking. I envisioned the bootcut pants will look smashing on me. I like the way they fit! I have worn the pair I have for more years than I can remember. Will keep wearing these at home but need a new pair for the gym and casual wear. Best fit I have ever found but they do run small. I weigh 140# so am ordering a size 4. Happy with the length. I am 5'9" and they are long enough. need boot cut for cooler weather, I just don'k like the skinny legs the younger crowd is wearing these days. I had a pair that were very similar and loved them. Hoping they'll be comfortable and look nice. Appears to be slenderizing and I'm looking for pants that can work as exercise and good on clothes so it's a two-fer. My granddaughter loves these pants. We have purchased a number of pairs over the last 3 years and they always wash well, wear well and look great on her. I have worn them before and they are marvelous. My present pairs are losing their elasticity at the waist but they are quite old and have served me well. Replace my old ones.... great quality, wears well, comfortable.- prefer over any others I have tried, been trying. I've been buying these active wear pants for years.. the style is flattering, nice, and comfortable.. However, I wish the material was still like the original pants.. Wears well, washes easily, goes with everything, and made in USA. I am an aerobics instructor and these are the best pants I've ever worn. I have 2 pairs that have lasted me over 10 years. Love them! I love these yoga pants. This will be my second pair. Its been awhile but I've purchased these before and loved them. I hope they are the same quality. I have these pants and find them easy to wear and very comfortable. Purchased ActivShapers in past and like fit. Because I purchased a pair over 5 years ago and I like to use them for exercise. Have two pair and they are aging. Love them. Sorry they are so expensive but I really like them. I have these already and love them. They wash great and keep their shape and don't shrink!!! I hope it will hold me in while I lose weight. This is my second pair of pants I ordered from this website and I was very pleased with the fit and comfort -also very durable. Comfortable for walking; comfortable to wear; attractive enough to wear out informally. I own 2 pair and have ordered some for my daughter. They hold everything in, even the legs, and make for a smooth appearance. Love them. They are thick enough to actually hold. What are the US size equivalents for Activeshaper DLX Slimming Bootcut Pants? BEST ANSWER: Thank you for your question. Size 1 is US sizes 2-4, size 2 is US sizes 6-8, size 3 is US sizes 10-12, size 4 is US sizes 14-16 and size 5 is US sizes 18-20. We hope this information will be of help to you.